Kaltran is a public transportation service, and everyone is welcome to ride! Our fleet consists of large and mid-size passenger buses, vans, and cars. All vehicles are ADA compliant with lifts/ramps for wheelchairs. Kaltran receives funding through grants from the Federal Transit Administration, the Washington State Department of Transportation, and generous contributions from local agencies and organizations. Kaltran enhances the economic and social well being of the Kalispel Tribal people and surrounding community through the delivery of safe, reliable, efficient and friendly transportation services. Kaltran will continue to provide Medicaid transportation services without interruption. We are committed to ensuring passengers are aware of the decision and have time to make alternative transportation arrangements. Rural public transit has been an ever-changing landscape over the years with grant funding becoming scarcer and highly competitive. We appreciate the support that our passengers have provided and feel the time is right to take a new direction. Tribal leadership is working to provide other employment opportunities for Kaltran team members and appreciates the years of service and dedication the drivers have provided. For more information, please contact the Kaltran office at (509) 447-7247. 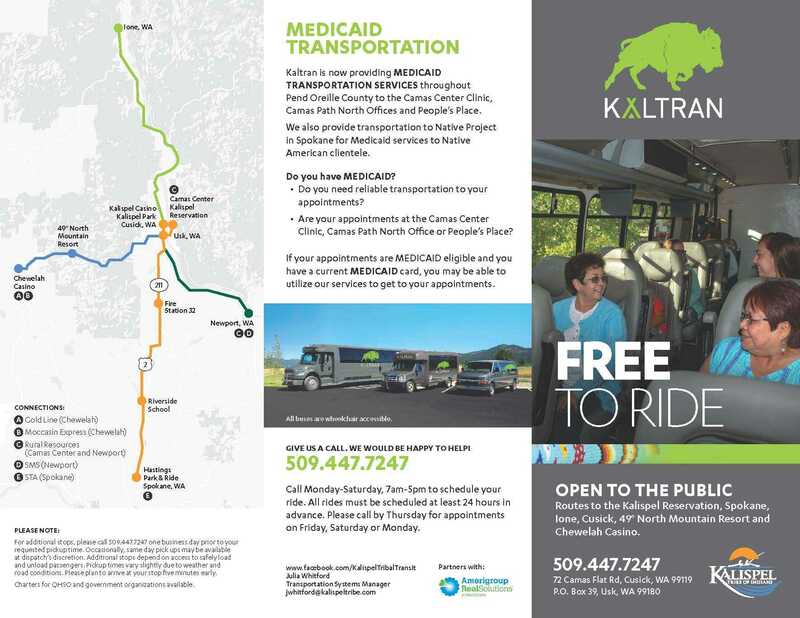 Kaltran provides fixed route service from Kalispel Park and the Camas Center in Cusick to Spokane, Chewelah, 49 Degrees North, Ione, and Newport. To arrange a deviated stop, up to 3/4 of a mile off the normal fixed route, or within the boundaries of the Kalispel Indian Reservation, call Kaltran Dispatch at (509) 447-7247. Kaltran operates seven days a week. 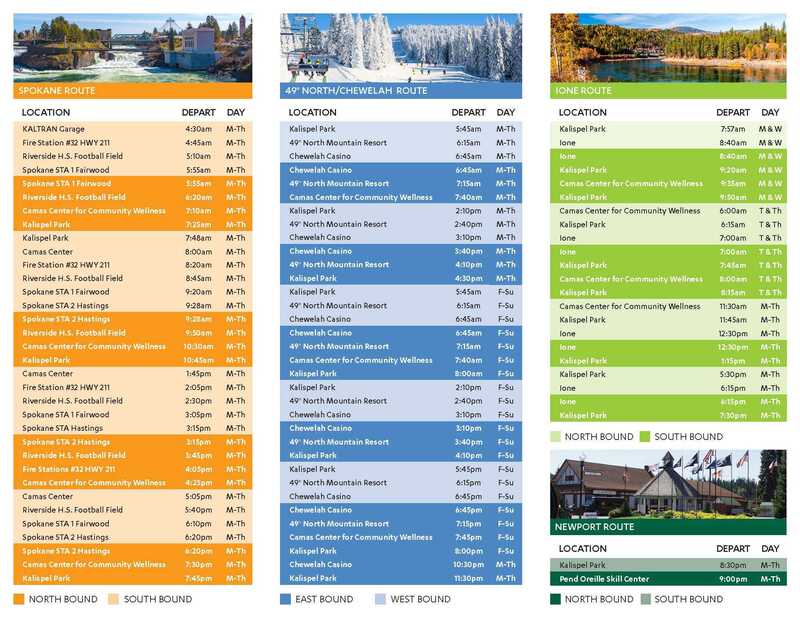 Please reference schedule for details on days and times for each route. For full schedule please download the Kaltran Bus Schedule. Please note that our schedule may change due to weather, especially in the winter. Whenever we have a service interruption we will post that information on Facebook and on our main phone line (509) 447-7247. Kaltran is free to ride and open to the public.